Hey guys! I just got my Maven box this month! I’m loving the designer they teamed up with this month! If you aren’t already a Julep Maven, STOP! You can get for first box for a PENNY. Why not at least try it out?! There are NO strings attached, shipping is FREE and if you don’t absolutely love Julep, you give them a call and tell them you don’t want to be a member anymore. It’s that easy! So click HERE and use the code COLOR2012 to get your first box for just one cent. 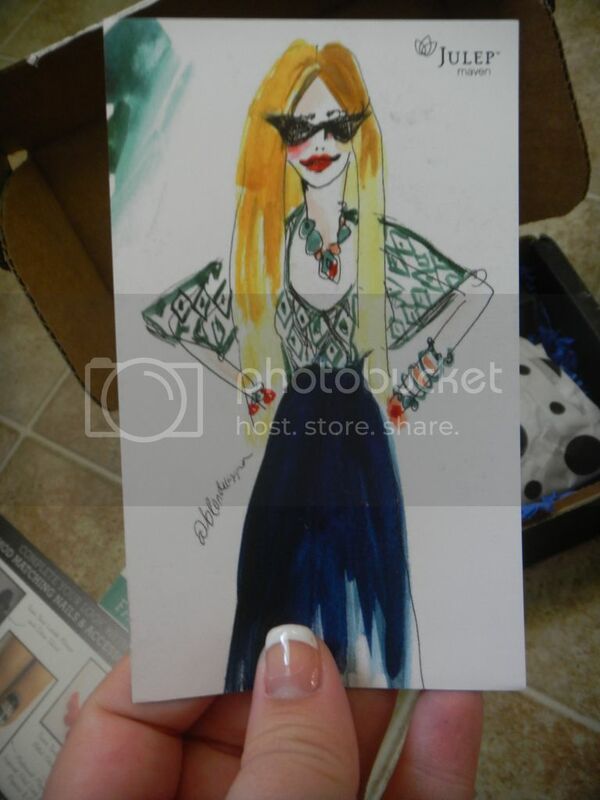 We got a really cool extra this month of a sketch that goes with our colors and our style. It’s actually a magnet! I thought this was really neat. It is not the strongest magnet I’ve ever owned and I don’t see it holding anything onto my fridge but this will be cute fridge art. This is my FAVORITE packaging so far. I love the dots!! I love you. I really do and you are one of my most exciting boxes I get each month, but I love you for WHAT you are. You are my go to nail care brand and subscription box. I hate to see you pretending to be something you’re not. You’re better than this generically packaged brown mascara. I have never considered a break up, because honestly, you’re the best I’ve EVER had, but don’t cave into the pressure to give “more” of yourself. Do what you do best! 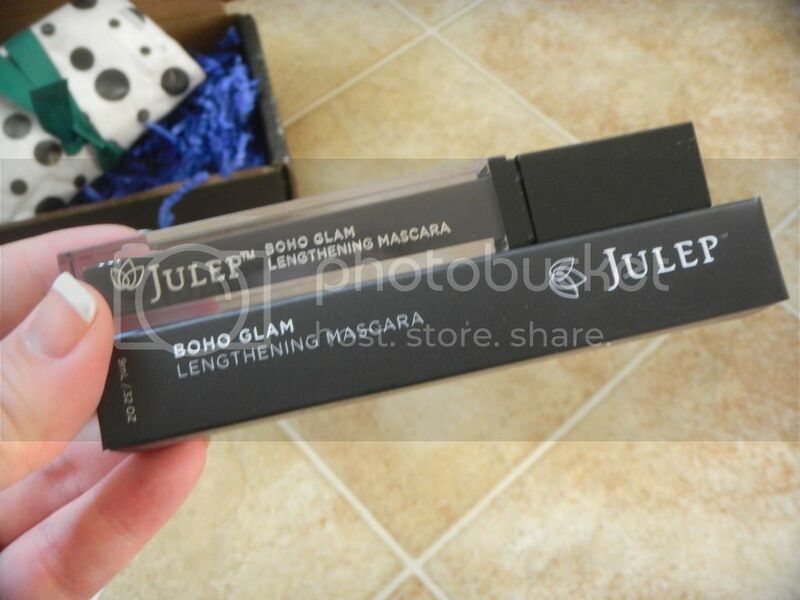 I haven’t tried this mascara and I plan to put it up for trade on the Julep Swap page, but I’m not saying it’s bad and for all I know it’s just as amazing as everything else Julep has sent me, I’m just not a Julep Maven to get cosmetics. I feel bad saying that because I know subscribers to other boxes that would KILL for a full sized mascara so, please don’t think I’m being a brat! I just love me some mani/pedi products 🙂 If you tried your mascara this month, please let me know what you thought!! And here are my colors. I’m SO in love. I went for colors I don’t usually purchase. For two reasons, first I want to expand my collection and two, because I couldn’t take my eyes off these! 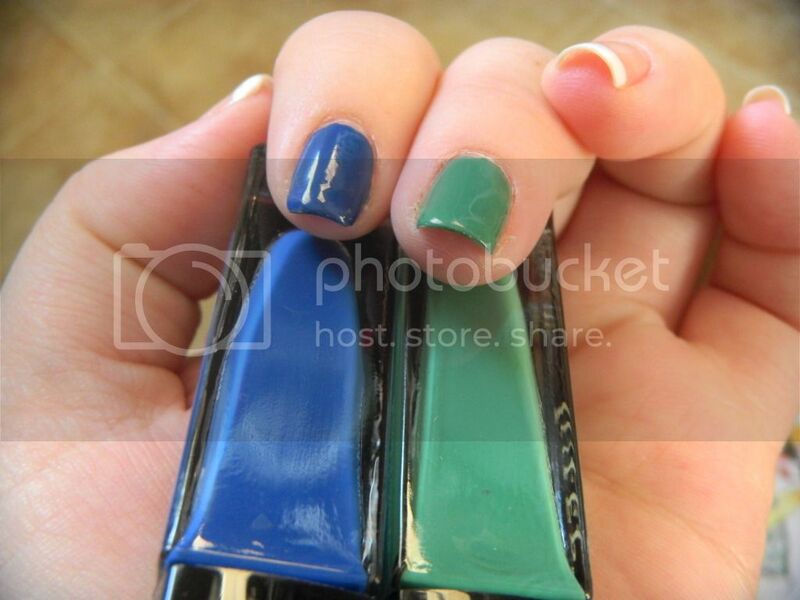 The color in these polishes are SO pigmented. These are one coat wonders! I’m loving them! I was so happy to see this collaboration this month, I look forward to seeing more months like this. It made the whole thing extra special 🙂 I saw a few people who got some extra special prizes from this designer too! So awesome!! This entry was posted in Cosmetics, Subscription Boxes and tagged august, black, blue, boho glam, brown, classic with a twist, green, it girl, julep maven, lengthening, mascara, new, popovka, september, swatches, trina turn. This was my first real month after my intro American Beauty box. I stayed with my profile and added Gunta 🙂 I think I got a bad mascara, not because of formula but the bottle. The wand comes out with a ton of mascara on it and is all goopy but after I scraped it off and made a huge mess I tried it and loved it. I think the black and brown are different, one is for volume and one is for length? I signed up for nail products too but I’m definitely excited about the mascara. It’s supposed to be not only amazing when put on but actually promotes growth and making your lashes healthy. I’m hoping all the hype is true 🙂 I like it so far as far as formula. Definitely need to call Julep about the bottle though. Sorry about your messed up bottle! I know with their lipglosses a few people’s plastic piece that “scrapes” away the excess popped off when they first opened (I was one of those “few people”) and that plastic piece was lodged in the cap. Your mascara sounds like the same thing happened to it. Certainly contact them because they will send you a new one pronto! And yes, the brown is lengthening (which I do NOT need, I have long lashes that lack “body”) and the black is volumizing. I read about the benefits of the mascara and that is neat too, but I use something for that already. I don’t think Julep has put out a bad product to date, I just wanted some nail care this month since we’ve been getting lip gloss, then mascara. Thanks for stopping by! I hope you love Julep in your next months! I’m pretty sure you will! !